Even the most conservative of capital markets firms are evaluating cloud technology. Boston, July 2, 2014 – Despite lingering concerns over the security and reliability of the marketplace, adoption of cloud computing is no longer a theoretical discussion among capital markets technology practitioners. Tightening margins and spiraling regulatory costs have driven cloud adoption over the last 18 months, and though concerns remain, firms have opened up to the possibility of using the cloud to maintain commoditized operations. 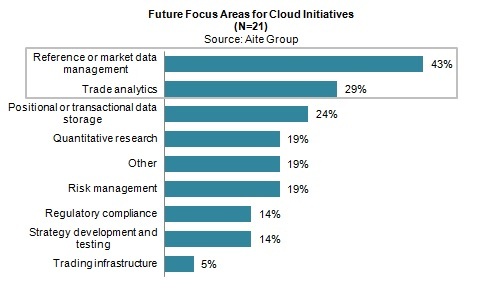 Based on Aite Group 2014 telephone interviews with 21 leading market participants from firms that have committed to leveraging cloud computing or are evaluating its merits, this Impact Report identifies challenges and opportunities in cloud initiatives and analyzes the potential benefits of moving to the cloud environment. This 26-page Impact Report contains 26 figures and one table. Clients of Aite Group's Institutional Securities & Investments service can download this report. The Search for Capital Markets IT Community: From Concept to Reality?